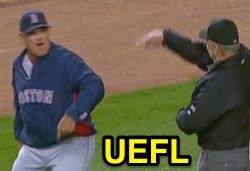 As predicted, MLB denied Boston's protest of an interference no-call during Saturday's Yankees-Red Sox game, according to Boston Manager John Farrell, who continued to state his belief that the protested play constituted interference—an argument that apparently failed to sway MLB. Holliday slides into first base in Boston. Recap of the Play: On Saturday, a ground ball to Red Sox first baseman Mitch Moreland purportedly confused Yankees baserunner R1 Matt Holliday enough that Holliday retreated—and slid—back into first base as Red Sox shortstop Xander Bogaerts attempted to throw out batter Jacoby Ellsbury, Holliday under the mistaken assumption that Moreland had tagged first base before throwing to Bogaerts, which would have removed the force play on Holliday at second. 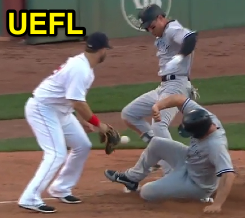 Due in part to Holliday's slide, Moreland was unable to field Bogaert's return throw, which struck Ellsbury and careened up the right field foul line as 1B Umpire Gabe Morales signaled "safe" (no interference). 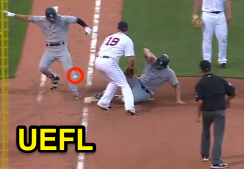 Recap of our Analysis: As we explained during Saturday's game, Holliday's running of the bases was legal, and even though his slide into first base prevented Moreland from making a play on Bogaerts' throw, Holliday's actions did not constitute a violation of recently-retired runner's interference pursuant to Official Baseball Rule 6.01(a)(5). Farrell's Basis for Protest: In filing his protest, Farrell hung his hat on the precise language of OBR 6.01(a)(5) Comment, which states, "If the batter or a runner continues to advance after he has been put out, he shall not by that act alone be considered as confusing, hindering or impeding the fielders." According to Farrell, "One of the other prominent words in the rule is that when there is a runner that is advancing—in this case, it was a runner that was retreating." As far as trying to convince the League office of his interpretation of the rule, Farrell admitted his team was unsuccessful, characterizing the exchange as "oil in water in terms of the two sides [Boston vs MLB]." Boston couldn't get MLB to affirm its protest. As we stated on Saturday under the section entitled "Red Herring," relying on Rule 6.01(a)(5) Comment's use of the word "advance" to claim that Holliday's actions were illegal is a semantics battle that has no bearing on the present interpretation of recently-retired runner's interference Rule 6.01(a)(5): Whether physically advancing, retreating, or simply standing, a runner will not be called out under OBR 6.01(a)(5) as long as his running of the bases is deemed legal and legitimate. Farrell responded to MLB's rejection by imploring of Replay Review, "I'd like to see everything be reviewable honestly. Even check swings." Related Post: Unreviewable - Pushed Runner Play Again Sent to NY (7/2/17). In other words, Farrell would like to see the murkiest of judgment calls fall under video review's purview, which inherently means taking such pure judgment calls away from the judgment of the on-field crew, and have such ruling be decided by the unknown judgment of an unnamed Replay Official far, far away. Relevant Rule: Replay Review Regulation II.K.6: "Unless otherwise provided for by these Regulations, no Replay Review shall ever be permitted on judgment decisions by the Umpire." For its part, MLB has repeatedly made it clear it has no intention to make such pure judgment calls (or "intent calls") subject to Replay Review. Previously excluded from Replay Review, MLB eliminated the traditional "neighborhood play" from baseball's rulebook, for instance, so that the corresponding expansion of review to cover this type of play would focus on the physical nature of whether a fielder actually touched a base, rather than whether the fielder was in the "neighborhood." Replay Review is meant to cover black-and-white plays, not gray ones. Related Post: Neighborhood Play No More - Tag Reviewed for 1st Time (4/7/16). Davidson ejects Farrell for arguing a Replay. John Farrell was the first big league skipper to be ejected for arguing a Replay Review decision, which took place barely two weeks into expanded replay's inaugural season, when replay overturned 1B Umpire Bob Davidson's out call at first base. 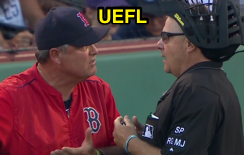 Related Post: MLB Replay & Ejection: Bob Davidson (5, 1; John Farrell) (4/13/14). The last affirmed protest in Major League Baseball occurred in August 2014, when the San Francisco Giants successfully protested HP Umpire Hunter Wendelstedt's decision to call a game after a rain delay due to unplayable field conditions. As a result of the affirmed protest, MLB changed Rule 7.02(a)(3) during the ensuing offseason to add "unintentional operator error in employing [the mechanical field device or tarpaulin]" to a list of reasons why a game may be postponed, but not terminated.